October 26, 2018 — We are delighted to announce that E4TheFuture’s policy director is the recipient of an Energy Champion award from Keystone Energy Efficiency Alliance (KEEA) in Philadelphia. 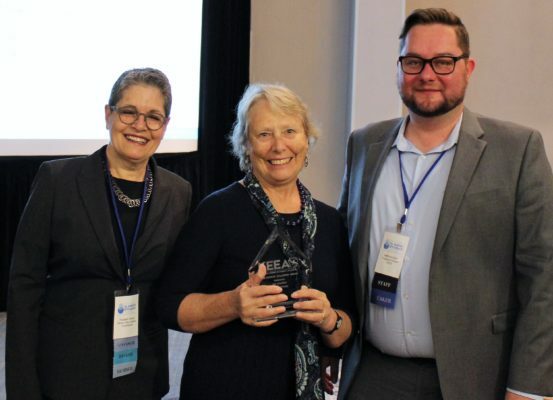 The energy efficiency advocacy organization chose Pat for its annual Vanguard Award because she is consistently at the forefront of change in energy efficiency policy. Pat Stanton joined honorees Alan Neuner of Geisinger Health (headquartered in Danville), and Alison Steele of Conservation Consultants, Inc. (Pittsburgh) who also received Energy Champion awards at KEEA’s 2018 Pennsylvania Energy Efficiency Conference.